Updated: Feb. 11, 2019, 7:40 p.m.
Seven-year-old Nevils Elementary student Nahla Bassfield was crowned recently as both 2019 Young Miss Statesboro and 2019 Young Miss Bulloch County. 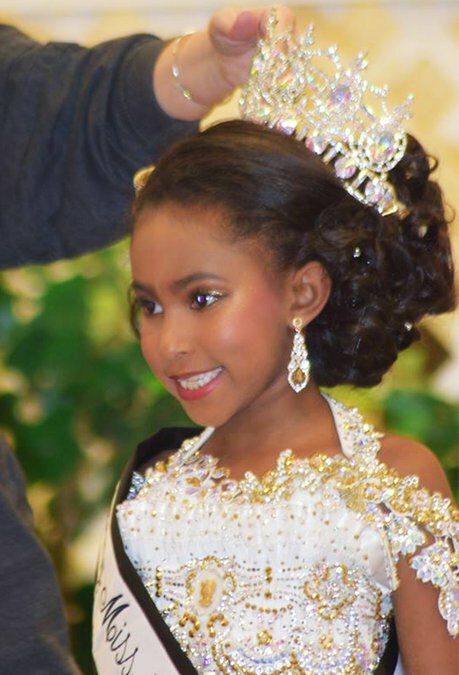 Bassfield is becoming quite the pageant expert, as she was crowned Little Miss SEB in the fall in a pageant that raised money for the school cheerleaders, and she also participated in the 2018 Kiwanis Ogeechee Fair and Miss Portal Turpentine pageants, placing in both. Sounding wiser than a "Little Miss" when she responded, Nahla said "I was shocked" when asked how she felt when she heard her name called as the recent pageant winner. She also said that getting her makeup done was a fun part of pageants, but her very favorite part of the pageant was "when they say I'm the prettiest one." The confident young lady, who takes dance lessons at Shay Morgan's Statesboro School of Dance, enjoys reading in school and playing with her cats, first learned about pageants while watching YouTube videos. "I just kept watching videos and I asked my grandma if I could be in a pageant," Nahla said, "and she said, 'One day.'" "One day" came when she brought home the paperwork about the school pageant in the fall. Nahla's grandmother Marie Graf, a former critical care nurse and a current Georgia Southern medical surgical teacher in the nursing program, gives God the credit for her granddaughter's success and confidence. Nahla's grandmother and grandfather, David Graf, a retired Navy sailor, are raising Nahla and have been since she was 4. "I adopted her mom when she was 4, and we got Nahla when she was 4," said David Graf, with sadness in his voice. In February 2016, Nahla's father, Bryan Bassfield, shot and killed Nahla's mother, Jessica Bassfield, during an argument. David Graf, who adopted Jessica and two other children with his first wife, was nearby changing the oil in his car when the shooting took place on their property off Highway 301 South, near the Evans County line. Four-year-old Nahla was swinging on a teeter-totter, and Marie was in the yard also. "The critical nurse kicked in and I ran inside to see if I could save her," Marie Graf said. When she realized that was futile, she hurried to Nahla, grabbed her off the swing set and dashed in the house, while others at the scene dialed 911. Bryan Bassfield was convicted of killing Jessica Bassfield and is currently incarcerated in middle Georgia. "Jessica had given her life to God," Marie Graf said. "She was a good mother and prepared Nahla for us to take over her care. "The only way we've gotten through this is because of our faith," she said. "Lots of prayer from the community. Lots of support from our church family at CrossRoads Community Church. "Nahla's personality and her faith — she's doing well. Lots of prayer laid over her from the community." Marie Graf said that Nahla continues to see a therapist that they refer to as her "talking doctor." "It's all about God," Marie Graf said. "He's helping us get through all this. And the pageants, what a blessing for Nahla. She's our little blessing."